Back Chat: New York! New York! Of course New York is not in New England. However, our wonderful New York interlude took place while Eugene and I were staying with Robin and James in their beautiful New England home. Therefore I have included it under 'The New England Diaries' banner. Please forgive me and Back Chat our literary licence. As I wrote the title for this piece, I almost sang it. I could hear Lisa Minnelli belting out her tribute to that wonderful town and Frank Sinatra declaring his love in crooning cadences. Oh Yeah! We were driving to New York from Providence. Robin and James were transporting us to the centre of the universe. It felt almost dreamlike to be driving for 3 hours instead of flying for 18 hours from South Africa. I am certain that I have had that dream. We stopped for lunch at a diner in Milford in Connecticut. Eugene and I had never eaten in a diner before and this was an adventure. What a super lunch! I had a huge tuna fish sandwich, absolutely delicious and Eugene gorged on one of his deli favourites, a Reuben sandwich. Now that is a sandwich to end all sandwiches! The Reuben sandwich is a hot sandwich of layered meat, sauerkraut and Swiss cheese, with a dressing. The meat is either corned beef or pastrami and the dressing is either Russian or Thousand Island dressing. Rye bread or crusty brown are the breads of choice. It is enormous! There are so many layers of meat that one can hardly open ones mouth wide enough to bite into it. Not for the faint- hearted. But, of course, we were on our way to New York where everything is bigger and possibly better than anywhere else under the sun. We were approaching New York! Oh my goodness, the excitement! We entered the city through the meat- packing district. Robin picked his way through the maze of one way streets and managed to avoid any traffic gridlock. 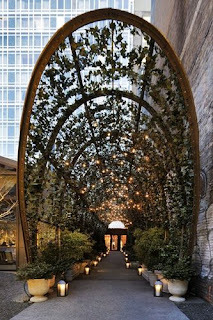 We headed for 9 Crosby Street and the new and exciting hotel, Mondrian SoHo. Exciting, edgy and incredibly beautiful. The decor, inspired by Jean Cocteau's 1946 fantasy comedy, La Belle et la Bête (Beauty and the Beast), allows one a respite from the hectic New York beat. You are invited into a world of chic luxury and fantastical whimsies. A stunning, arched garden walkway ushers you into that world. Fairy lights above and standing lanterns placed at ground level light the way as the noise of the city recedes. The blue and white lobby with quirky chairs and Abyu lamps that look like big feathery puffs, has a ceiling painted with a swirling rose pattern. It is beautiful and otherworldly. 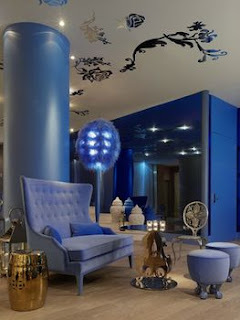 This blue and white colour theme is carried from the lobby throughout the hallways and into the rooms. Our room on the 16th floor was special and different. We entered a compact, very symmetrical-looking living room, with floor to ceiling windows and views that made us gasp. Through to the bedroom with its blue ceiling and snowy milk-white bed. Again the staggering views and despite the sea of white, blue and glass, gentle on the eye. Eugene loves exploring hotel rooms and finding how things work. Our information centre was an ipad, safely in its dock waiting to explain everything to us. Woe betide anybody that did not understand ipads. What a joy, no jet lag! A moment or two to freshen up, unpack our overnight cases and then it was time to hit the streets. You can feel the energy of New York in the streets and a visit to New York would be incomplete if one did not immerse oneself in the street culture. We adore it. Our gallants swept us onwards. I had never been in the New York subway and was amazed at how much like the Paris metro the system is. We surfaced somewhere near Times Square and it was raining! Suddenly out of nowhere, men appeared selling umbrellas. Quite extraordinary. We bought umbrellas and set off to join the long lines selling tickets for the theatre. Now, another plan. James would work the queues (lines) and Robin would take us for a drink. The place, The Marriott Marquis in Times Square,the heart of the theatre district. We zoomed up 48 floors in a glass elevator (lift). How I hate glass elevators and sort of cowed in a corner like a wounded animal! However, even I could not ignore the amazing sight of the atrium of the hotel that extends all the way to the roof. We reached our destination, The View Restaurant on the 48th floor, the only revolving restaurant in New York. What a view! A 360 degree panorama of the buildings around and beyond Times Square. The movement of the restaurant is slow and stately taking an hour to complete a full revolution. Quite bearable. 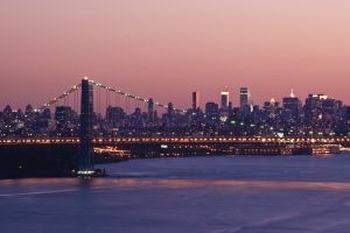 We sipped crisp chilled Californian white wine and wondered at the view of Manhattan at sunset. James arrived with tickets for a production by the Roundabout Theatre Company, 'The People in the Picture'. The theatre, the old Studio 54, was just a stroll away and we arrived there all agog and expectant. There is much to remind one of the glory days of Studio 54, faux leopard skin carpets, gilt balustrades and velvet drapes. All very atmospheric. The production was expertly mounted and staged but the theme, a story of a grandmother recalling her life in the holocaust, was disturbing. Onwards to dinner after the theatre. Robin had secured reservations for us at Joe Allen Restaurant. What a whirl! We happily walked about 8 blocks to the restaurant. The rain had stopped and the streets hummed with excitement. 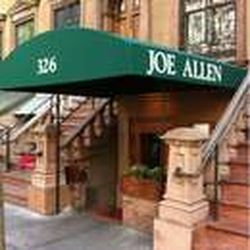 Joe Allen at 326 West 46th Street, has been a Broadway mainstay since 1965. It was still busy and bustling when we arrived. Tables are covered with butcher paper and the exposed brick wall next to our table was lined with posters of famous Broadway flops, called the 'flop wall'. Frankly, looking at this eccentric chronicle of theatrical disasters, it seemed a puzzle why some of them had bombed. A waiter arrived to take our orders. Well, he wasn't exactly rude..... he was just a weary New York waiter who wasn't going to be charming or make life any easier for anybody who wasted his time dithering over choices. While Robin and James made their choices quickly and easily, Eugene and I must have driven Brandon, that was the waiter's name, quite mad. Finally, I decided to start with a mixed green salad. As a main course, I ordered chicken, slowly braised in red wine and served with mashed potatoes. Comfort food, but that is what Joe Allen specialises in. The problem was which dressing for the salad. Brandon rattled off a whole slew of choices and quite terrified, I chose a Thousand Island Dressing. Eugene chose a main course of pan-roasted fillet of Scottish salmon with Romesco sauce and a Farro salad. The food arrived with brisk efficiency, New York style, no messing around. It was all delicious. My green salad was crisp and crunchy and the dressing, tangy and creamy. I adored the chicken. It was succulent, juicy and with lots of lovely gravy to soak up the mashed potato. James had ordered a steak tartare, a favourite of his and a speciality of the house. He got stuck in with gusto. I think that one must have a cast iron stomach to eat steak tartare late at night. Robin enjoyed a grilled marinated free-range chicken, also with mashed potatoes. He had side orders of sauteed spinach and sauteed mushrooms which we shared. Eugene pronounced his salmon as perfectly cooked and loved the crunch of the Farro salad. It had been a lovely late night dining experience. But the evening was not over yet! We stepped out into the night. The streets were busy and alive with people rushing everywhere and cabs jostling and hooting! 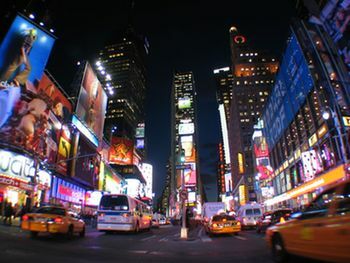 We were on our way to see Times Square at 1 o'clock in the morning! Nothing could ever have prepared us for that remarkable sight. Huge billboards with brilliantly illuminated adverts reach into the sky. The displays seem to compete with one another for attention. A Toyota advertisement shows a car speeding down a billboard and we watched its descent over and over again. Beautiful people display beautiful clothes and LG proclaims to all the world that 'life is good'. We were in another world, a sort of 'Son et Lumiere' with the lights and sounds of Times Square. And so to bed! A perfect night's sleep and fresh and ready the next morning for a precious full day in New York. As Robin and James had business appointments, we would make our own way until we met up later. We had it all planned. Breakfast around the corner at a bustling diner. Wonderful fresh orange juice, toasted fried egg sandwiches and coffee that smelt and tasted like heaven. A cab to 11 West 53rd Street (we were not going to risk wasting time getting lost in the subway) to MoMA, The Museum of Modern Art. One of the joys of spending time in NewYork is revisiting the wonderful art museums. Alas, today we would not have time to visit all of them, but MoMA and the Metropolitan Museum of Art were going to be our special choices. 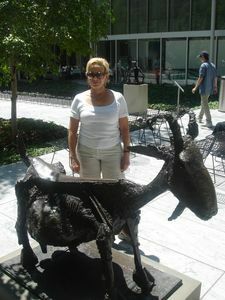 The first stop would be the famous Abby Aldrich Rockefeller sculpture garden in the courtyard at MoMA and Picasso's incredible nanny goat. I love this piece which stands towards the west end of the sculpture garden. Picasso sculpted this piece in Vallauris in the South of France in 1950. His studio was next to a potter's yard and he rummaged around the debris looking for discarded material he might use to build his goat. He crafted a skeleton of the goat with these materials and filled it out with plaster. Magnificently, a wicker basket forms the rib cage, modified ceramic jugs are used for the udders and palm fronds for the spine and the snout. 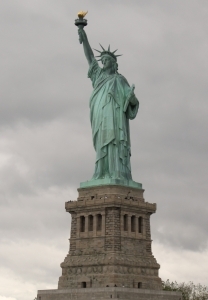 He cast it in bronze in 1952. This has been a focal point for me ever since I first visited MoMA. Seeing the sculpture again represented a pilgrimage completed. There is so much to see and marvel at in that garden. Spindly sculptures by Giacometti, Matisse's mastery as a sculptor, Rodin's John The Baptist, no doubt disapproving of the brilliant yellow Madonna, part of a group of figures by Katharina Fritsh and more, so much more. We left a contribution at Yoko Ono's Wish Tree and made a wish to return. We love just sitting on a bench and letting the happenings of the courtyard be our companions. Indoors, there is such a richness of choice that one is easily overwhelmed, so we opted to visit special favourites which include the incredible collection of French Impressionist and Post Impressionist works. I had a special adventure in the early days of my visits to MoMA. I happened upon Picasso's masterpiece, Guernica. It was housed, on its own, in a sort of smallish ante room. I would sit on a strategically placed bench and just gaze at it. This extraordinary mural that he painted in 1939 when German and Italian warplanes destroyed the Basque country town of Guernica, hung in MoMA for years. He decreed that Guernica would never hang in Spain as long as fascism reigned. Eventually after Franco died and democracy was restored, MoMA reluctantly relinquished its treasure and Guernica returned to Spain. But I had had the privilege of private audiences. 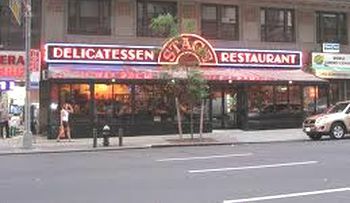 It was lunchtime and we walked to the Stage Deli on 7th Avenue, two blocks from Carnegie Hall. How these famous names just roll off the tongue! New York is famous for its deli food and we dithered a while as to which of these palaces of excess we would visit. The Stage was a good choice. We were served by a deli waitress named Barbara. Over-made up, garrulous and wearing large glass jewellery, she was just lovely. She asked us the usual touristy questions and when she heard we had been to MoMA, she launched into a dissertation about art. She told us that she had been collecting prints of the French Impressionists for years and that she had quite a formidable collection. Imagine discussing the merits of the French Impressionists with a New York Deli waitress! Eventually we got round to ordering. I chose one of those huge tuna fish sandwiches that I adore and Eugene, a pastrami sandwich on rye with fries and extra pickles. Well, the sandwiches were both huge and delicious and wonderful! All around us people were eating massive portions of food. I was totally unrepentant about the zillion calories in the food in front of me and tucked in with gusto and delight. I wish I knew what tuna fish they use for their mixture, I have never been able to replicate the taste. I didn't leave a scrap and then crunched away at the divine pickles. At home we would call them half-pickled cucumbers. Eugene beat the odds and finished his sandwich. I tasted it, it was a triumph. Layers and layers of home-made pastrami, that The Stage Deli boast is the best in New York, on bread that they bake themselves. Food for the gods! Farewell to Barbara and out into the New York sunshine. We crossed to Fifth Avenue and strolled to the Plaza Hotel. It is a lovely walk and it gave us the opportunity to window shop at some of the most exclusive stores in the world. The Plaza stands in all its majestic glory at Cnr Central Park South and 5th Avenue. The history and allure of the Plaza has always fascinated us. 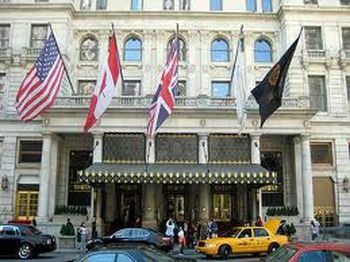 The Plaza was opened in 1907 and its first guests were Mr and Mrs Alfred Gwynne Vanderbilt. It has played host to princes and potentates and most fascinatingly in my opinion, it was the social playground in the 1920's of Scott and Zelda Fitzgerald and their fast living literary and arty friends. Ernest Hemingway is reputed to have advised Scott Fitzgerald, to "give his liver to Princeton and his heart to the Plaza". Now that is really cool! Our visit to the Plaza was almost like a courtesy call to a much loved and splendid great aunt. We greeted her with much affection and wandered around embracing her elegance and hauteur. Just a short visit and we took our leave and wandered across to the iconic glass cube entrance of the Apple Retail Store at 797 5th Avenue. We had only read of this incredible structure and had promised ourselves a closer look. Amazingly it is open 24 hours a day, 7days a week and 365 days a year. It was surrounded by hoardings as there is a 6 million dollar revamp underway. No matter, we were allowed to enter. 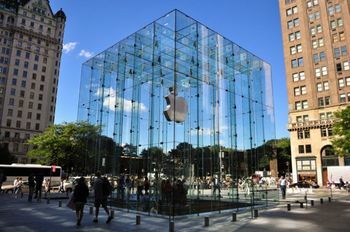 This huge glass cube entrance has a glass staircase that leads to an underground retailing area. Imagine, I was terrified of a glass elevator and now I was in a glass building! But this was sublime. It was like walking on air. This is probably the most extraordinary modern construction that we have ever seen. Just time to take a cab to The Metropolitan Museum of Art. 'The Met' at 1000 5th Avenue, is huge. The main building is almost a quarter of a mile long (400) metres and occupies more than 2,000.000 square feet (190.000 square metres). 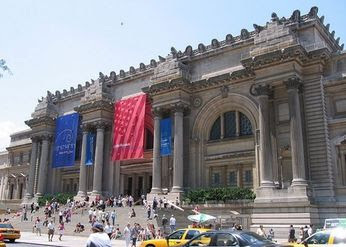 Housing an amazing collection of art and antiquities, it is one of the biggest art museums in the world. Again we just had time to visit some old friends, that is if we could find them. Museums have this maddening habit of moving things around. But soon we had to leave, it was time to meet James and Robin. Our 24 hours in New York were spent. Can one ever have enough time in New York? I doubt it. The adventure continued on the 3 hour drive back to Providence. We stopped at the Mohegan Sun, a casino belonging to the Mohegan tribe in the foothills of southeastern Connecticut. It is the 2nd largest casino in the United States. Fascinating surrounds and architecture! We had dinner at a restaurant within the casino complex, Summer Shack, owned by the famous chef, Jasper White. It would be the first time that Eugene and I had ever had a clambake. Delicious! Then home at 3 o'clock in the morning. It had been an incredible ride. Les, I loved what was a nostalgic, and surprising, 24 hour visit to New York. 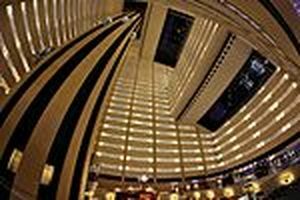 As you know, I have visited NY often and although I hang out at TKTS near Times Square and theatre district a lot, have NEVER been up the elevator in the Marriott Marquis, although been in the foyer several times! What a treat. Also I didn't know about the hotel in Crosby Street... what a find. 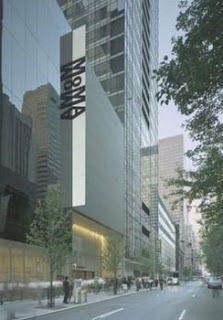 Your descriptions of MOMA are seductive. I salute you for finishing the sandwiches. I haven't been to the Stage Deli for years. I think the locals don't think it's so good anymore but your description makes me want to go back. Thank you also for the lovely comments about the piece. Your comments are so generous and lovely. Thank you! I do hope that you and Maddie do visit that extraordinary place. I know that you would love it. What a wonderful nostalgic trip down memory lane - I was transported back to the Nanny Goat at MoMa, the delicious deli foods, the wonder of the city at night and the glory of it all. Thank you so much for your enthusiastic and generous comment. I am so happy that the piece pleased you and revived memories of that extraordinary place. The New England Diaries what a otherworldly read. The pics meld so well with your written word. You write like you speak. Wonderful and full of interest One can feel the excitement and worthyness of your effort.. Thank you for your terrific comment. I am delighted that you enjoyed the piece. Eugene and I love New York and it remains one of our favourite places.